Dimensions: 11.5" x 17.75" x 2.75"
I got this in canary yellow and it really looks fantastic. It is bright and nice to look at. Everyone compliments it. I absolutely love it! I ordered the large size in white for my craft studio, knowing that it was not something I would ever make myself. What a delight this clock clock is!! I have painted the walls and parts of the furniture that stores all my craft supplies in shades of green and purple... much of the storage furniture is white. I have placed this lovely clock on a purple wall, and have not yet decided whether to add color to it. It pops in the room as is. 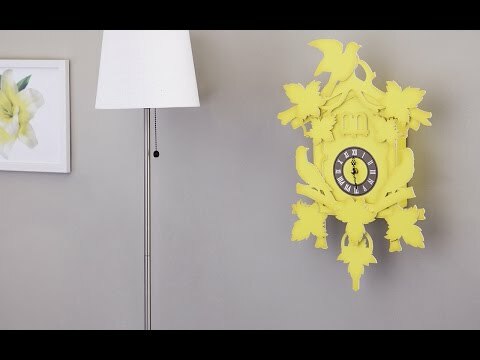 Perhaps a chartreuse or lavender painted edging is in this clock's future.